Welcome to PAABA’s Tax Salon! 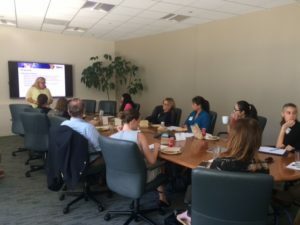 On June 21, 2017, the Tax Salon and PAABA’s Labor & Employment Section co-hosted “Tax Issues In Employment Law.” Speaker Mindy Mayo is a Director and Human Capital Taxation practice leader at the San Jose location of Ryan, a national corporate tax services provider. Ms. Mayo’s expertise is in payroll auditing, and she led us efficiently through tax traps and best practices in employment contracts, settlement agreements, and severance agreements. Read the debrief or contact Mindy Mayo. Thanks to Wilson Sonsini Goodrich & Rosati for hosting. The Tax Salon’s previous presentations include Top Ten Tax Issues for Startup Companies, How to Read Tax Returns, and How to Handle a Federal Tax Dispute: Audit, Appeal, and Litigation. If you’d like to present a tax issue to PAABA’s membership, please contact Morgan Martin and Roger Royse.